This is the final blog in a series of articles on the Ten “Must-Have’s” in your Landscape. Landscapes are natural elements and should be enjoyed by some wildlife and animal members of our family. Our yards would not be the same if we didn’t see little creatures foraging, or hear the birds singing. My dad who was an avid gardener commented to me that something is going on with the birds as they were no longer visiting his garden and he was missing the birds singing. I didn’t have the heart to tell him that I could hear them just fine and it wasn’t the birds that were missing, but his hearing! For years I resisted the temptation to add a bird feeder to our yard. The reason, we have cats and I didn’t want to provide them with a ready supply of food. Our cats have become older, and slower, so last year we added a bird feeder. I don’t know much about birds, but I soon figured out that you need to be able to keep the birdseed dry in the feeder! Birdfeeder #2 performed much better than birdfeeder #1. We learn by our mistakes! It also requires a little work on our part to keep the feeder clean, but well worth it. I love to watch the birds come and go and listen to all the noise that they generate in the garden. I don’t even mind that there are a couple of squirrels that eat breakfast there every day. It is quite hilarious watching them balance on the feeder. If you don’t want squirrels to eat all the food, there are feeders that are squirrel proof. I have also learned that the type of bird seed you use seems to have a direct link on the type of birds that are attracted to the bird feeder. So check out our Tips & Advice page on Birds to see which birds to attract. 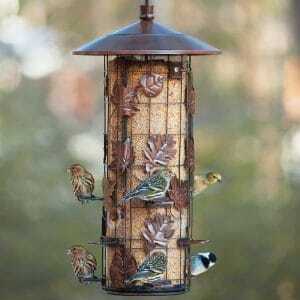 We have a wide variety of feeders and bird seed at the Family Tree Garden Center. I had to write a bit about cats, as I do know about cats! If you love cats make sure you have catnip planted somewhere in your yard. I have a patch and all the cats know where it is. It is funny to watch them roll around in it. If you don’t have somewhere in the yard, you can grow catnip in containers. 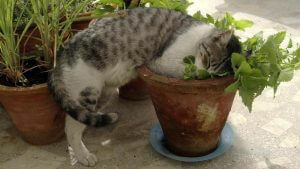 Cats also like catmint, but this definitely takes a second best to catnip. 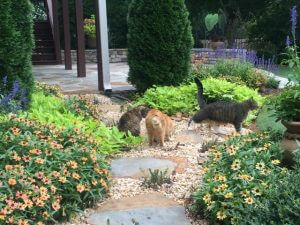 If you don’t like cats and you are tired of your neighbor’s cats coming into your yard, there are deterrents that can be sprayed onto plants that will keep them away. Regina at the Family Tree used to groom and show dogs in her former career so she has given me some good tips on ways to keep fido happy in the landscape. 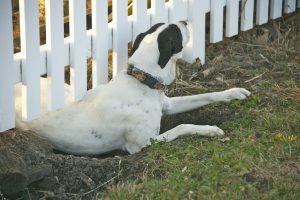 Dogs love to escape and dig under fences. Strong gauge chicken wire can be buried along both sides of the fence line to deter dogs digging. Also, if you have a gate area, try putting pavers down on both sides of the gate. Dogs are territorial and will patrol the perimeter of the yard, so if you can, put plantings a few feet away from the perimeter fence so that the dog has room to patrol. Dogs will use the same route in a yard and you will see a well worn path develop. Your dog is designing your landscape for you, so where the worn path is, turn that into an actual path with gravel or mulch. This will keep the dog’s paws clean. Raised beds help deter dogs from entering garden beds, or even a low fence if your dog is persistent. Dogs will also resist entering gardens if you have thorny bushes, or tall grasses planted. If you want pops of color with annuals and you know your dog will probably destroy them, try putting the annual color in containers to brighten up the landscape. There are a lot of poisonous plants in the landscape and some can have a devastating effect on our beloved pets. I have friends that lost both of their dogs to the poisonous flowers on a Sago Palm. 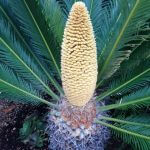 My friends live in Houston where Sago Palms live year round. Sago Palms don’t flower very often, but when they do, they produce a bright orange/yellow bloom that seems to be irresistible to dogs. Check out the full listing of poisonous plants at aspca.com. We have two rabbits enjoying our yard and they have been there for a few years. I watch them in the mornings to see what plants they are attacking, but so far, they have done minimal damage so I am ok with them sharing the yard. However, deer are another matter completely. Thankfully we only have deer occasionally, but a number of our customers complain about deer eating everything in their landscape. If you have a deer problem, the first plan of attack is to plant deer proof plants. 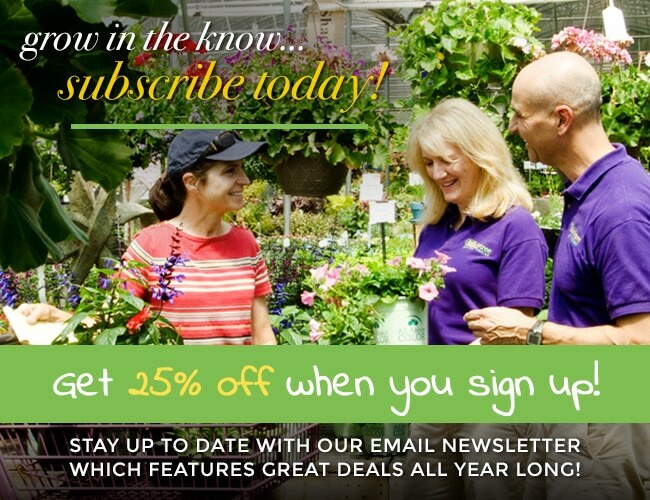 Refer to our Tips & Advice page for plants that will be deer resistant. Milorganite is a fertilizer for lawns and we have had several customers that use this as their fertilizer as it deters deer. There are also deer repellants that can be sprayed.